Home/Blog/How To Cut Stainless Steel In Production ? In the process of mechanical production, stainless steel is often used in processing due to its corrosion resistance in the atmosphere or corrosive media. Stainless steel can be classified into chrome stainless steel and chrome nickel stainless steel according to chemical composition. According to its metallographic structure, it can be divided into martensitic stainless steel, ferritic stainless steel, austenitic stainless steel and the like. 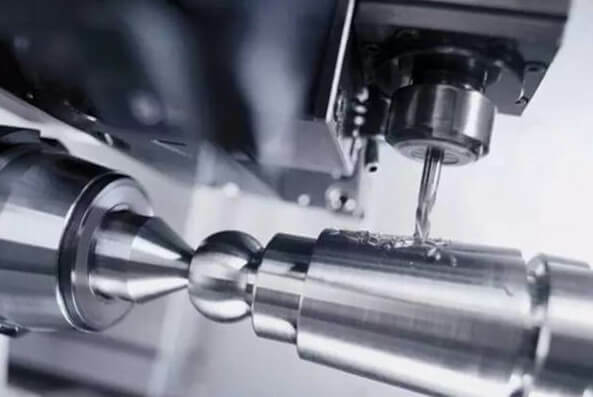 When the stainless steel is machined in machining, the surface hardening is severe, the cutting force is large, and the cutting temperature is high, which makes it difficult to perform turning. Below we will introduce the common methods of cutting stainless steel in machining production. Turning stainless steel requires a tool material with high heat resistance, good wear resistance and small affinity for stainless steel. With ordinary high speed steel, the durability of the tool is low. With high carbon, molybdenum and high vanadium high speed steel, the durability of the tool can be doubled. The tool material has good toughness and can use a large rake angle to reduce the cutting force and cutting temperature, so that the depth of the hardened layer is reduced, and the cutting edge can also be sharpened, meanwhile the cutting is light and the chip and the tool are not easy to bond. Good tool toughness is more suitable for roughing and interrupted cutting of vibration. The cutting speed of turning stainless steel is only 40%-60% of the cutting speed of ordinary carbon steel. If it is too high, the tool wear will be accelerated. The turning speed of general carbide turning tool is (50-100) m/min, high-speed steel car. The cutting speed of the knife is (10-20) m/min. The feed rate should not be too small, so as to avoid the cutting of the tool on the hardened layer and the tool wear is aggravated, generally (0.2-0.5) mm/r. The tool should not stay on the cutting surface to prevent the cutting surface from hardening, which will make it difficult for the next infeed. The depth of cut should not be too small, (2-5) mm for roughing and (0.2-0.5) mm for finishing. Under normal circumstances, the emulsion can be used for roughing, and the lubricating fluid with good lubricating properties such as mechanical oil and spindle oil can be used for finishing. If an emulsion or sulfurized oil containing an extreme pressure additive such as sulfur or chlorine is used, the lubricating effect is better. Emulsion: It has good cooling and cleaning performance, and also has certain lubricating effect. It can be used for stainless steel roughing. Vegetable oil; good lubrication performance, poor cooling performance, suitable for threading, reaming, tapping and other processes. Sulfurized oil: It is a cutting oil with sulfur as the extreme pressure additive. It is not easy to break at high temperature, has good lubricating effect, and has certain cooling effect. It is suitable for fine car, semi-finished car, drilling, reaming and tapping.